Pretty nifty little device, and the price is a good fit. Competition for the Chumby maybe? Or Chumbo? Whatever it’s called, I use my phone as an alarm clock. Today, Sony has given the doubters a reason to perk back up and pay attention, as the April-bound device will ship with the ability to stream Watch Instantly content from Netflix. 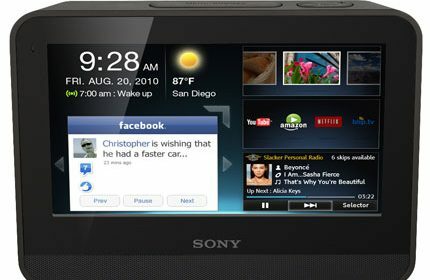 As if that wasn’t enough, Demand Media will also be offering Dash-tailored portals to content from eHow, Golflink and Livestrong.com, and it’ll have no issues streaming "online music videos, television, or film content on-demand" to the 7-inch touchpanel.